Starlight Radiance's Grand Opening Giveaway! Hello everyone! 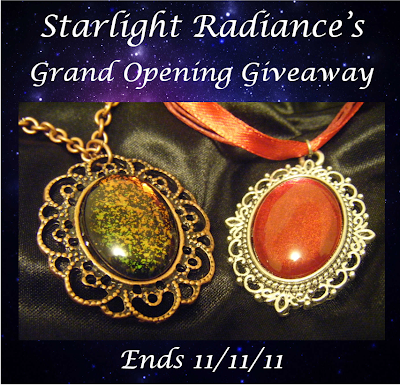 I thought I would leave a post here directing you all to my giveaway at Starlight Radiance that is celebrating the opening of my jewelry shop on Facebook. Head over to Starlight Radiance to enter! Big news, everyone! I have decided that I will be moving my blog over to Starlight Radiance on Blogspot. I've felt for a while that The Clumsy Kiwi just didn't quite fit the feel I was going for with my blog, and I have a few things in the works that were also a push in the direction for a different name. (Those are soon to come!) I'll have some new manicures from the 31 Day Challenge up soon over at Starlight Radiance. I've loved having you all as my readers and I hope you all will join me over at Starlight Radiance to see what's new and coming! Hello all! Everything has been very busy recently, and I'm actually currently wearing my "Day 2" polish right now, because I hadn't gotten around to posting my red yet. So here it is! Del Sol - Heartbreaker. A very nice glittery red polish that turns a bit purple in the sun, though not as purple as that bottle would suggest. This is three coats of Heartbreaker, a red jelly base with red glitter, that turns into a purple jelly with red glitter in the sun. Please excuse the tipwear. I believe this was after about three days of wearing the polish, and after helping my mom pack and move a bunch of boxes into a storage unit. She's moving to Texas for a while to be with my grandmother. Here's a good comparison of the color change in the sun. Very pretty! And here is another sun comparison, although the ring/pinky fingers had been in the sun for a couple seconds, so they were a little darker than the normal red. I really love my Del Sol polishes. They are so much fun to watch change color! Also a good indicator as to whether or not your windows in your car are UV-protectant. Hehe. (Mine change color a tiny bit in my car - for shame!) I hope you enjoyed this color as much as I did! As always, happy painting! Hi everyone! Before I post my Day 1 manicure for the 31 Day Challenge, I'd like to share a promotion with you guys that I saw over at Nouveau Cheap for Butter London that ends this Wednesday, August 31st. They are giving away a free bottle of Royal Navy polish with any purchase! I would definitely love to grab one up for myself and get Royal Blue to try out Butter London, but I'm a bit strapped for cash right now. Alas... I hope that some of you can use this promotion if planning on getting something from Butter London! The code is ROYALAUTUMN. 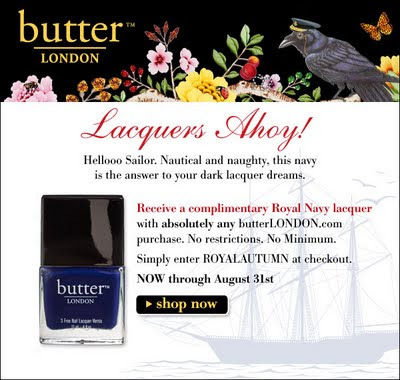 If you want to, go have fun getting your free Royal Navy from Butter London!!! Happy polishing! Gooood morning! This is probably the first time in a looong while that I actually got up on my own without an alarm this early (at about 7:30). Whew. I usually sleep in till about 10 or 11 each morning, and this is a nice little change. I hope it will keep up! What I have today is something I've been seeing spread around the nailosphere that looks like fun. 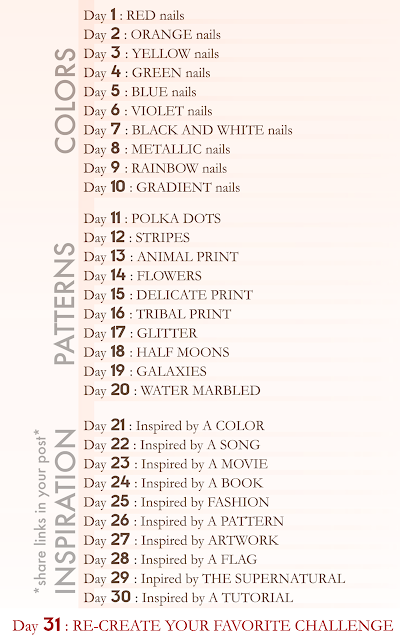 A 31 Day Nail Challenge! Except I'll be doing it at my own pace like I've seen that Wacky Laki and Polish this! are doing. I'm not much for changing my nails every day, but hopefully this will really help me work toward getting through just a few of the polishes in my stash. On to the challenge! If anyone would like to join, just let me know so I can check out your challenge nails too! My First Blog Birthday! And My First Crackle Polish! What about that? My blog's First Birthday was this past Saturday! I was having a blast at Carowinds that day so didn't get to post until now. I've been working on my med school application and have started a nice little serving job at a restaurant while still looking for another job applicable to my degree, so I've been pretty busy. I haven't painted my nails in what feels like FOREVER, but I still love to! For the past few days I had on a nice green foil from Petites called Utopia, and it was wonderful. At first when I got it, I thought it was a green glitter, but I don't think I have many foils so yay for me!!! And recently I purchased my first crackle (OMG!) - Vintage Violet by Sally Hansen. I checked the brush while I was in the store and it seemed fine, but when I brought it home, it looked uber wonky, which I think contributed to making super thick coats when I put it on. With this being my first crackle, I guess I need to get a little more experience with it in getting an even, not so thick coat. I may end up returning it, but all the stores I've been to have been out of all the other colors except blue. I may just have to deal with the brush. I hope you enjoyed my first adventures into crackle polish! Happy Painting! Hello-ello! Here's a quick little manicure from the vault using Wet n' Wild Teal of Fortune that's been called a dupe of Zoya Charla/OPI Catch Me in Your Net. I meant to post this a while ago, but it somehow slipped my mind! Here it is at two coats with base and top coat of Borghese Brilliante. The first and third pics are most color accurate. Indoors. Ooooh sparkly! Plus bling! Indoors. This is with three day tipwear. Still pretty good! That's about it for me for now, ladies! Till next time... Happy painting! Hello nail polish enthusiasts! I'm a recent college graduate, a cat lover, and a nail polish fanatic! Welcome to the chronicling of my adventures into the world of nail polish! I think it, I say it. It's my way.